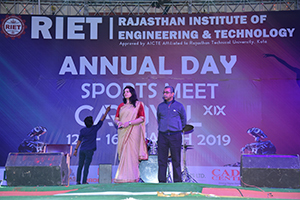 Rajasthan Institute of Engineering & Technology organized its Annual Day celebration on Thursday, 16th March 2019. Among the luminaries who adorned the occasion were Honorable Chairman RIET, Ku Bheem singh ji, Honorable Chairman BOG Shri R S Tomar, Honorable Mrs Snehlata Singhji, Vice president, Central Co operative Bank, Dholpur Bharatpur, Principal RIET, Dr. Saroj Hiranwal, The Dean Academics Professor Kapil Dev Sharma and Vice principal RIET Dr Sachin Sharma, T&P Advisor, Prof D D Johri. The chief guest on this occasion was Prof Sudheer Kumar, Professor MNIT. 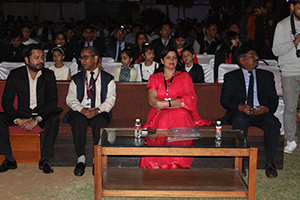 Mr J K Sharma, Principal DPS School Bharatpur was also among the dais dignitaries as a special guest. Principal RIET, Dr. Saroj Hiranwal, The Dean Academics Professor Kapil Dev Sharma and Vice principal RIET Prof Sachin Sharma, welcomed the chief guest Prof Sudheer Kumar, Professor MNIT, Jaipur, and Mr J K Sharma, along with all the excellencies, Who lit the lamp and declared the commencement of the ceremony. The event commenced with Ganesh vandana, a dance recital by the RIET students, followed by various other Traditional dances and songs. Comedy skits and comedy dances which were admired by all and cheered by the audience. The entire cultural programme swayed the mass to the rhythm. 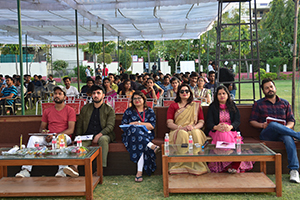 The evening programme started amidst cool breeze and heartwarming welcome speech extended by the Dean Academics & Admin Professor Kapil Dev Sharma. He thanked Honorable Chairman RIET, Ku. Bheem Singhji, Honorable Chairman BOG Shri R S Tomar, Smt. Snehalata Singh Vice president, central Co operative Bank, Dholpur Bharatpur, and all distinguished guests, for their presence in the Annual day celebration along with all other distinguished guests on the occasion. He also thanked the Principal RIET, Dr. Saroj Hiranwal, HODs, event coordinator and students for their cooperation in making the event a grand success. He appreciated the untiring effort put by the organizing team to make the plan a reality. 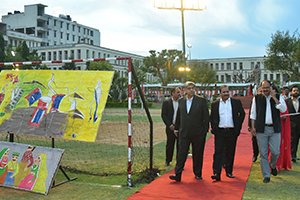 He encouraged and looked forward to many such events where there could be exhibition of hidden talents and a kinship of a team which could develop between the faculties and students. Principal RIET, Dr. Saroj Hiranwal, presented the Annual report. In her speech she mentioned that RIET has been recognized and given Grade “A” position among 116 engineering and technical colleges in Rajasthan by Rajasthan Technical University on the basis of QIV scale. She also informed all that recently the organization has established an international artificial intelligence laboratory in collaboration with Rentula Pvt. Ltd, USA , to pace the knowledge in the field of artificial intelligence. This year more than 45 research papers have been published by our faculty members in international and national journals. She added that, our alumni Sanjay Lakshmi naryan has published 5th book on “Human Space”. This year RIET has organized 5 Faculty development programs in association with NITTTR, Chandigarh. She mentioned in her report that the emphases on minor & major projects have always been the prime responsibility of RIET. Students have developed project like solar car, Home automation system , Game Design , health care app, ATV, 3 wheeler Quard bike”, ISS, RC plane, Drones, IOT based project and many more in this year which shows our progress, commitment, dedication and Excellency towards Research & Development. Standing out among 2 lacs teams, Mr. Rohit Kumar & team from the ECE department was selected in National level smart India Hackathon, March 2019 held at IIT kharagpur. The team propounded the idea to make toll plaza smarter which reduces traffic, waiting time, pollution etc. students got the appreciation certificate by the Govt. of India. RIET has taken initiative and started the first center in Rajasthan for Telecom Sector Skill Training, in collaboration with Telecom Sector Skill Council (TSSC), Government of India, on the call of our Hon’ble Prime Minister for “Make in India” and “National Skill Development” program in the direction of Youth Empowerment. Till now we in RIET have trained more than 300 trainees in telecom field and currently we are authorized to conduct training of 500 students under PMKVY scheme and enrolled 497 students under this scheme. We have signed an MOU with Winner Academy, Jaipur, NASSCOM , FACE academy to conduct special training programme for campus recruitment as well as for 360 degree development of the students . Training is being conducted though out the year in which students of first year to final year are being trained in soft sills, technical skills, aptitude skills and personally development by industry- academia experts. The various Placement drive in year 2018-19 has set a new record both in placement rate in the first phase and the hefty packages offered to students. Our hiring partners range from consulting firms to core industries, software giants, E-commerce and engineering companies, with the leading recruiters likeIBM, TCS, INFOSYS, PINNACLE INFOTECH , Ahead websoft, Extramarks, HeroMotocorp, JCB, Genus power, ICICI , AU small finance, e-sunsolar Scope etc. For the second continuous year RIET was chosen as a venue job fair by the Sub regional employment exchange office, during which more than 70 companies participated. Job Fair-2019 at RIET attracted more than 2500 job seekers out of which approximately 1264 successfully cleared the preliminary selection Round. In technical events category our students got first prize in Digital Quiz competition at MNIT, Jaipur, and 1st prize in JKLU in technical quiz. More than 16 undergraduate & 12 post graduate students have published research papers in international journals. Our mechanical final year student Karan chauhan and team members won the third prize in SAE convention 2019 (North India section) “automatic seed sowing machine”. This evening was the most awaited hour for the winners of various events who eagerly looked forward to the prize distribution ceremony. 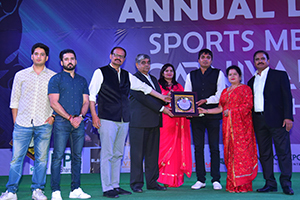 Participants were felicitated on the basis of scrutinized results, besides; special recognitions were given to a number of students for their outstanding achievements in curricular and extra-curricular activities. This evening also saw the award giving ceremony of the faulty members for their performances in various categories. Chairman RIET, Ku Bheem singh ji as well as Principal RIET, Dr. Saroj Hiranwal felicitated and awarded all those faculty members who had performed well by giving 100% result in the university examinations. The ceremony was very important for all the awarded members who felt proud to be recognized. “Excellent faculty award for extracurricular activities” was also awarded to some faculty members for their performance in this category. The other dais dignitaries also joined in the award giving ceremony. Honorable Chairman BOG Shri R S Tomar, chief guest Prof Sudheer Kumar, Professor MNIT, Honorable Mrs Snehlata Singhji, Vice president, Central Co operative Bank, Dholpur Bharatpur, The Dean Academics Professor Kapil Dev Sharma and Vice principal RIET Dr Sachin Sharma. All the senior members were full of praise for all the award winning faculties. Honorable Chairman RIET, Ku Bheem singh ji, in his words of wisdom, appreciated all the students for their performance in the function. He also said that the institution has been performing excellently in various capacities and such development can only come up with hard work by the students and the faculty members. He added that as our former students have made all of us proud by their distinguished work in numerous capacities therefore they are an inspiration to all the young and budding technocrats of RIET. Their alma mater feels honored by felicitating its protégés on this Annual day. He wished all the students present and Alumni all success in their endeavors. 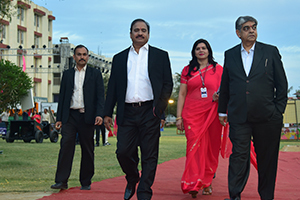 A great number of Alumni had attended the function and each one was felicitated by the senior faculty members. Honorable Chairman RIET, Ku Bheem Singh ji, congratulated the entire award winning faculty members and the award winning students for their marvelous performance. This evening also saw the unveiling of the annual magazine “The DPS Times” for which the staff members of DPS Bharatpur were accompanied by the Principal DPS, Mr J K Sharma. All the dais dignitaries commemorated the honors by presenting the same. Speaking on the occasion Prof Sudheer kumar, Professor MNIT, said that Education is not just the amount of information that is put into a student’s brain unrelated and unassimilated. The very essence of education is the concentration of mind and intellect. Education is about far more than what happens within the four walls of the classroom and students here in RIET are very fortunate to have such teachers, trainers and instructors who recognize this. You are commencing your journey of translating your education to the benefit of the world. May every one of you realize your potential fully and wholly to make this country and the world a better place for all of us. He mentioned that RIETians have received excellent education from their professors and staff. He urged all to remember that performance leads to recognition. Recognition leads to respect. Respect leads to power. 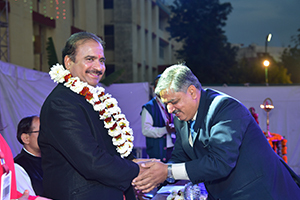 The various guests who were felicitated on the occasion and who had devoted their precious time to be a part on this day were Col (Retd) J S Lamba, Ku Abhishek Singh, Chairman, Zila Bhumi, Vikas Bank, and also an “Alumni”2008 pass-out, Ku Abhinav Singh, RIET Alumni, MD, Guiding Star corporation, Shri Anandi Lal Kumavat, Branch manager, BOI, Bhankrota, Jaipur, Prof Bajrang Lal Kakralia, Shri Deeparam ji, Director, Prince Residential School, Shri Bhanwar Choudhury, Director, Genius school, among many others. A large number of “Alumni” of various batches (since 2000) were in attendance on this annual occasion; names of some are Tejpal singh Dara. 2007 batch of ECE dept, currently working with JTO BSNL, Vinay pal, 2016 passout of ECE dept currently working as team leader Airtel, Piyush Sharma, of ECE dept.Token of recognition and remembrance was given away to all them who had graced the occasion. 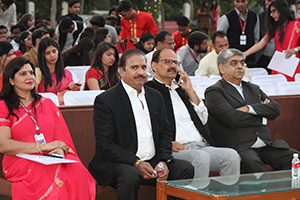 The “Alumni” who are currently a part of the RIET family were also honored and felicitated on the occasion. They are HOD ECE, Er. Shashikant Ray, Dr.vijay Sharma,CSE Dept,Er. Amit Bairwa,CSE dept, Er.Dinesh Swami, CSE dept, Er.Vimal Kishore Kumawat, ME dept, Er. Shikha choudhury, HOD MCA (pursuing Phd in RIET) and Er.Hemant Rathore, CSE dept. The evening witnessed various Traditional dances and songs. 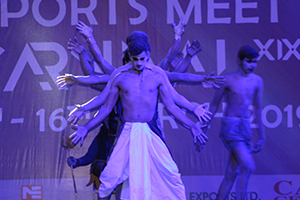 Comedy skits and comedy dances which were admired by all and cheered by the audience this included the entire cultural programme which swayed the mass to the rhythm.The programme was an amalgamation of various hues befitting the environment wondrously. The evening commenced with a scintillating invocation Dance- Ganesh vandana. Theme based dances both Western and Folk dances captivated the guests. The shiv tandav dance stole the show with its immense imagination, beautiful formation and terrific action. 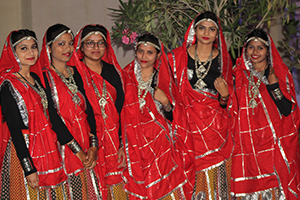 The Garhwali dance and the other folk dances spread a spectacular feast to eye and ear. The costumes added color to the festive occasion with the synchronized dance movement to the foot tapping music. The evening ended with vote of thanks extended by Event coordinator Ms Jyoti Khandelwal, Asst Prof CSE dept. She thanked Honorable Chairman RIET, Ku Bheem singh ji, Honorable Chairman BOG Shri R S Tomar, Principal RIET, Dr. Saroj Hiranwal, The Dean Academics RIET, Professor Kapil Dev Sharma and Vice principal RIET Prof Sachin Sharma for their support and guidance. She thanked the students for making this occasion a massive success. The band performance by the Rhythm group of RIET played in its exuberance. This in the end had students as well as teachers rise and shake a leg with their colleagues. This was followed by the national anthem. The event concluded beautifully with thousands of fresh reminiscences embossed in the hearts and minds of all involved. The late evening delicious dinner came as a conclusion, served to all the Guests, staff, faculties and students of RIET.